Chengannur legislator Saji Cherian said he feared there were at least 50 dead in the town and broke down in tears as he pleaded on a TV channel for helicopters to airlift those stranded. With 324 dead and more than three lakh people in relief camps in Kerala after floods and landslides due to heavy rain, the worse is not yet over for the state. Chengannur, about 120 kilometres north of state capital Thiruvanthapuram, has been cut off for days, and there are fears that many have died there. Soldiers and boats have been sent to the town and reports said bodies had been found, although there have been no official update on the deaths. Mr Cherian also said the people in the town haven't received a single packet of food. A red alert has been sounded for 11 of the 14 districts of Kerala as the state braces for more rain. 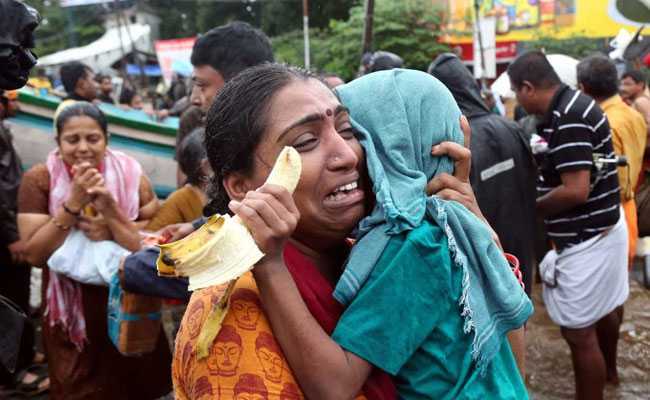 People all over Kerala, which has a population of 33 million, have made panic-stricken appeals on social media for help, saying they cannot make contact with rescue services. Troops of the Army, Air Force, Navy and the State Disaster Response Force are engaged in an unprecedented rescue and relief operation, as Kerala battles the worst floods in a century. 38 helicopters, over 400 boats and many personnel are trying to get those stranded to safety and drop food and water. Prime Minister Narendra Modi, who conducted an aerial survey of the flood-hit areas of Kerala on Saturday, announced an immediate relief package of Rs 500 crore.